Tom, Kaare and I headed to Kingston, Ontario on Sunday the 18th of September. We left early and hoped to be on the water by 1 or 2:00 p.m. but traffic jams got in the way and it was 6:00 p.m. before we started the four mile paddle to our first campsite. We decided to drive up in one car, drop Tom and the equipment at the Cataraqui Canoe Club in Kingston, rent a car and drive to Ottawa where we left Kaare’s car and used the rental to get us back to Kingston. Unfortunately on our way back we ran into a traffic jam in Ottawa that slowed us down and then something happened on the 401 that caused them to shut it down from both directions. That caused a major traffic jam and ate up a couple more hours. Finally we got back to Kingston and to our boats. 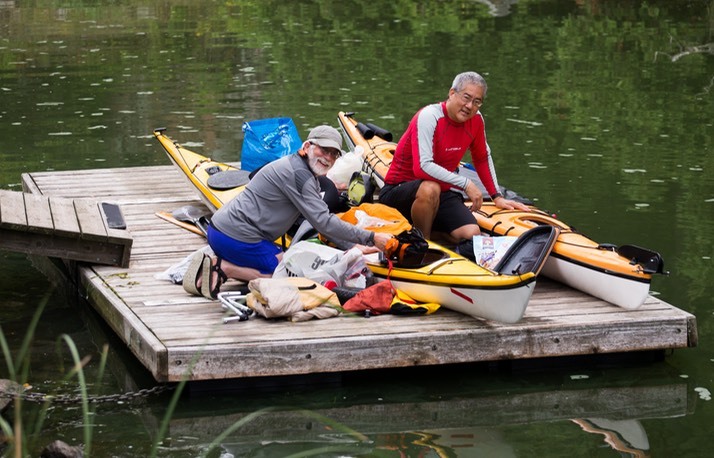 A Canoe Club member let us use the Canoe club bathroom, we grabbed drinking water and finally started paddling. It was warm and humid and my shirt was soaked through by the time we got to Kingston Mills. This trip was all about timing and antique locks. 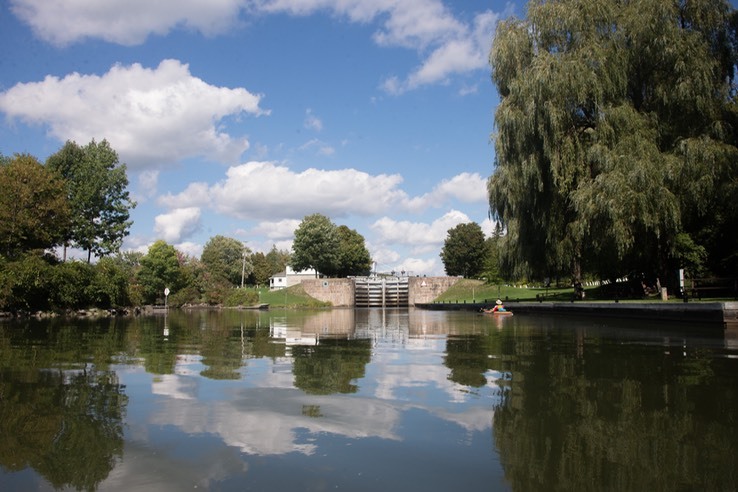 The Rideau canal was built in the 1830s to ensure safe transportation between Kingston and Ottawa in the event that a war with the US blocked the St. Lawrence. Most of the gates are still wood and the opening mechanisms are windlasses and chains. Our most frequent and interesting encounters with the local population was with the lock keepers. Since it was past the busy summer season the locks did not open until 10:00 a.m. and the lock keepers left at 4:00 p.m.This meant that if there were several locks together you had to get to the lock by 2:30 or 3:00 p.m, or there wasn't enough time to lock through before they left. If we arrived at a lock too late we camped on the wrong side of the lock and could not lock though until it opened at 10:00 a.m. the next morning, making a very late start for the day. That is what happened Sunday night/Monday morning. The entire trip was 120 miles long and we only had six days in which to do it. If we had lighter kayaks (that is, with less stuff) we could have portaged around the locks, in fact at one lock three husky young lock keepers carried our boats around four locks rather than take the time to lock us through. On the other hand the weather was mostly ideal, the countryside beautiful, the trees had started to turn, we passed though a number of pretty and quaint little towns, and had a great tail wind on the largest lake we had to cross. Tom powered ahead following the well marked channel. Kaare and I would try to cut the corners but often ran into weed beds. We saw a variety of birds: ospreys, herons and loons. Some wildlife, a mink tearing flesh off a dead fish and Kaare caught a close-up of what we think is a black squirrel swimming across our bows. Tom and Kaare are great companions and the trip was fun and worthwhile. If I were to do it again I would stick with September even though the locking hours are an hour shorter. We saw evidence that the power boat traffic is much heavier in the normal season and our weather was pretty much ideal for paddling and camping with few insects and comfortable sleeping temperatures. I would take more days or do a shorter distance to allow for a little more exploring of alternate routes and spend more time visiting the towns on the way. 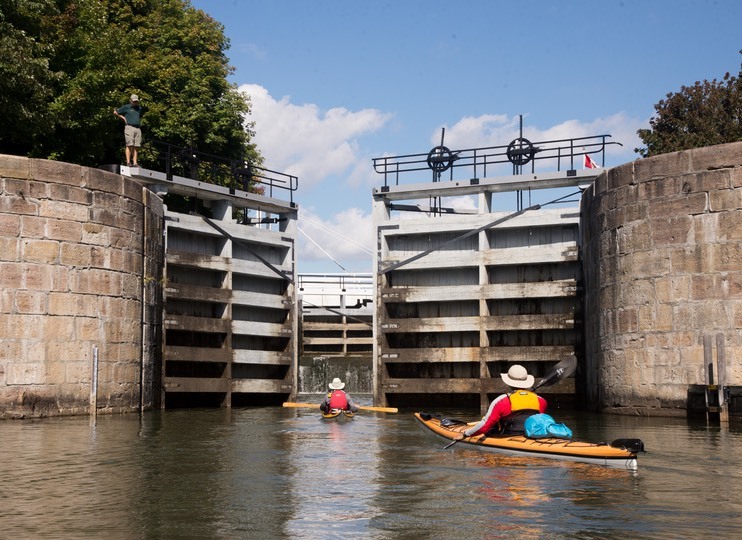 Unlike the Erie Canal, the Rideau charges for kayaks by the foot, it cost about $70 each for the lock permits for the week and about $5 a night per person to camp at the locks. 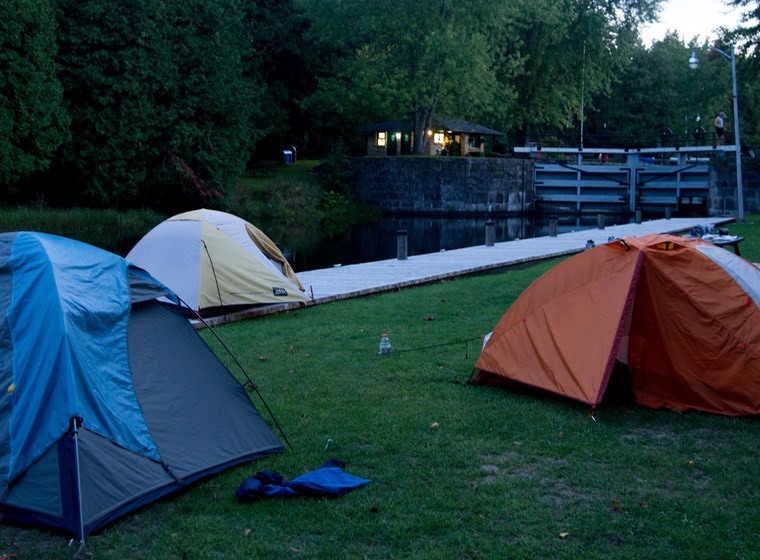 We camped one night at a marina, but typically the locks are spaced about the right distance to use them as a destination, and the grounds are well kept and park-like. We mostly cooked our own dinners but we had a great fish and chips at a "chip truck" in Newboro and a very nice dinner in a restaurant in Merrickville. Also a great breakfast at the Lockside "Rooster-rant" in Smith Falls while we waited for the locks to open. 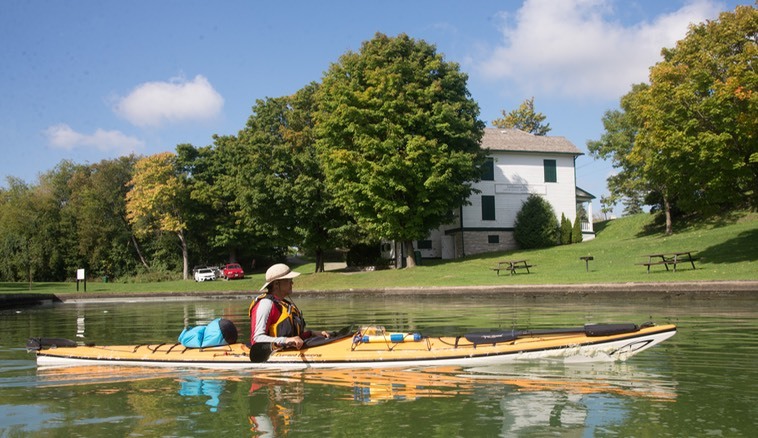 Actually Kaare and I spent a couple of days earlier this summer paddling at the western end of the Erie Canal, Buffalo to Lockport and then west and east of Rochester. The Rideau is less channelized, mostly rivers and parts of rivers that were damed and now are lakes. But we also saw some pretty and charming villages on the Erie out in the western part of the New York State. Interestingly my GPS decided to no longer receive satellite signals, Kaare had waypoints for all the locks but only topo maps on his and Tom had navigation information but no way points. But I had decent canal maps with some navigation information and we muddled our way through. I now have a decent collection of defective Garmin equipment. 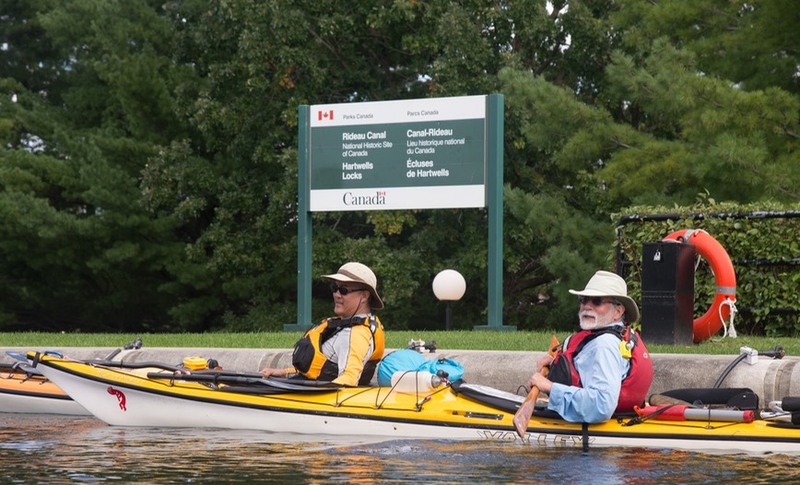 Click here to view the Rideau Canal Photo Album.